banaras ka khana: A pizza baking class by Chef Theo at Hilton, Mayur Vihar..
A pizza baking class by Chef Theo at Hilton, Mayur Vihar..
An invitation to a pizza baking masterclass is a welcome thing for anyone like me.Someone who likes baking her own pizza from scratch, learning a few tips from a master would always be wonderful. 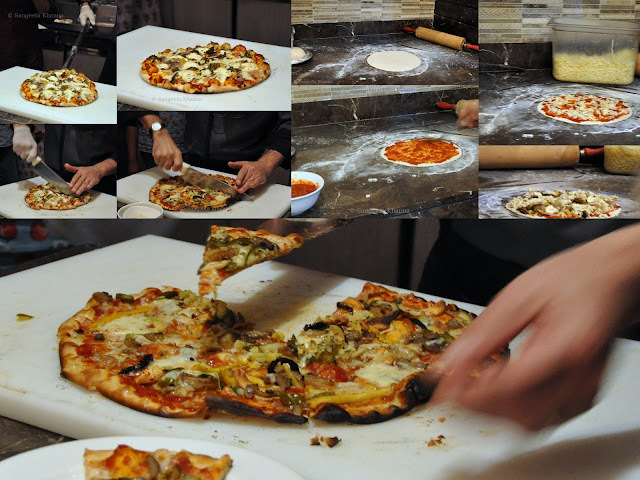 So when we were invited for a pizza baking masterclass by Chef Theodore Rudiferia, the Italian Executive Chef at Hilton, Mayur Vihar, we all were happy to get to see how 'they' bake it. Especially an Italian Chef who has helped set up Pomodoro at Hilton, Janakpuri. I had met Chef Theo once when Chef at Large had co hosted a Burger eating competition at The Roadhouse. A handsome looking Chef with a pleasing smile and quick wit. He introduced us to brief history of pizzas and then proceeded to bake pizza from scratch. How pizza was known as the bread of the poor and then Chef Rafaelle created a new pizza for the queen of Italy Margherita de Savoia in the late 1800s. That pizza for the queen was garnished with tomatoes, mozzarella cheese and basil, representing the colors of the Italian flag. Pizza Margherita was born for the love of the nation. And now it is loved all over the world. The deep pan pizzas and the 'heavy loaded with toppings pizzas' might get popular with some, for me it is always the thin crust with flavorful toppings. I never order pizza, I bake them from scratch or I eat them at this Pizzeria of Banaras whenever possible. This one was started by some Italian student some two decades ago. Well, there were a few bowls with the ingredients and some kneaded dough already proving so the pizza can be rolled out for us to see. 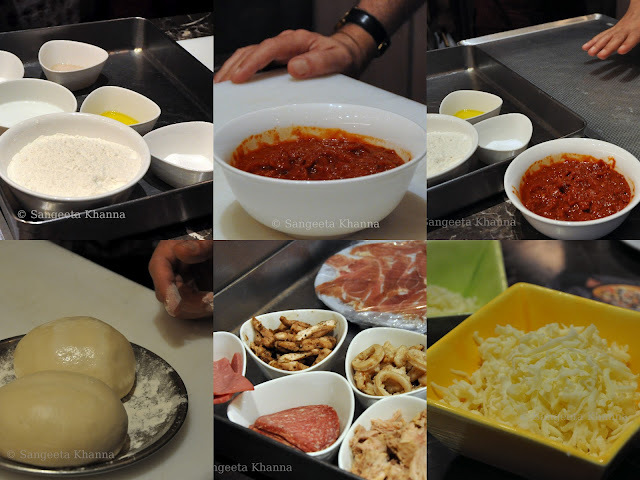 There was a little disappointment for me being crazy about bread dough and making my hands dirty with it, but that was forgotten when Chef Theo continued with the pizza rolling, applying the sauce on it, sprinkling toppings while telling us a few tips on how to bake it perfectly. I learnt a few tricks myself about the toppings. The tomato sauce as we call the Passata or the Concasse' should be freshly made using the freshest of red ripe tomatoes. This Concasse' is freezer friendly I can vouch for, having been dependent on my small portioned freezer boxes of this pizza/pasta sauce. It has been handy for many of my pizza parties in the past. A balance of flavors in the tomato sauce that is sweet, sour and acidic with a rich flavor of herbs and garlic. Look at the rich color and nicely reduced thick sauce there. That is the key to a nice topping. I learned how the meats, seafood or even vegetables should be seasoned well and cooked well before we top them on the thin crust. I used to cook the meats and seafood but some of the vegetables were topped raw in the past. No more of that mistake again as I now know how it affects the flavors of the topping. Would love to make an Aubergine pizza next. Nicely grilled aubergine slices taste yummy on that crust. Chef Theo baked five types of pizzas for us. A classic Margherita, an Aubergine and bell peppers, a Zucchini, mushrooms and pickled veggies, a salami and other cold cuts and a seafood pizza with shrimps and Calamari. All of them were yummy and filling. More fulfilling was the experience to see them being made from scratch. Thinly rolled out pizza base, not applying too much pressure while rolling, tapping the edges before applying the sauce and topping are a few tips that make a difference. The oven should be as hot as possible and the base should be blind baked first in case of home baking where temperatures don't go above 250 degree. The toppings should be done quickly after that and the pizza baked turns out to be slightly burnt on the edges. That is a good sign of a well done pizza. The edges should be brushed with EVOO immediately after taking out the pizza from the oven. And yes, the topping shouldn't be too much to weigh down the crust and to prevent it's cooking. Thinner toppings, richer taste of the toppings through appropriate seasoning and quick baking on high temperature coupled with the thinnest possible crust would be my favorite pizza any day. This is exciting to watch someone cook in front of you all from scratch. Well covered Sangeeta...now I am even sadder I couldn't make it. That you for sharing the experience so well - the concasse looks so good! I want to bake a pizza now!! I apologise for the inconvenience Rohan. Thanks for taking the pain to let me know, but I lost all my blog pictures unfortunately due to a technical glitch. Restoring them one by one and will try and do it for Paneer pasanda on a priority basis.